Neighbors panned an earlier plan for the property, calling it too suburban. Above, a rendering of the latest proposal. The Boston Herald’s newly vacated South End headquarters, its reporters gone and its printing presses shuttered, is slated to be transformed into the “Ink Block,’’ a six-acre complex of apartments, stores, and restaurants. The property’s new owner, National Development, yesterday outlined a plan to replace the Herald’s squat brick building with four new structures containing 475 apartments, a grocery store, and a mix of smaller shops and restaurants. The proposal came days after the tabloid moved its offices to the Seaport District and began paying The Boston Globe to print and distribute its newspapers circulated in the Boston area. National Development’s plan is a vast departure from an earlier proposal for a smaller project that neighbors panned as uninspired and too suburban. The new version calls for buildings from five to nine stories, with each designed to have its own modern flair, featuring facades clad in glass, brick, and metal. The revamped plan would also move 400 parking spaces to the interior of the site, where they would be hidden by the buildings. National Development will soon file a detailed plan with the Boston Redevelopment Authority, kicking off a permitting process that is likely to take several months. Tye said he hopes to start construction by the end of the year. National Development has built several large projects in Greater Boston, including the Marriott Residence Inn in Charlestown and the Station Landing residential and retail development in Medford. It is also part of a joint venture that is developing the Kensington, a 27-story residential tower under construction in Chinatown. The Ink Block project would be one of the largest residential developments in the city and would be built on of its few large tracts of buildable land. Only the South Boston Waterfront boasts bigger commercial construction opportunities, with several mixed-use projects being planned. Tye said the Ink Block project would cost hundreds of millions of dollars, although he declined to be specific. The project picked up speed after the Herald moved to Fargo Street in South Boston. The newspaper’s publisher, Patrick Purcell, is a minority investor in National Development’s effort to revitalize his former South End property. So far, the revamped plan is generating support from neighbors who hope it will become the centerpiece of a new district with residences, stores, and offices. A city-commissioned task force recently published guidelines to spur redevelopment of the industrial properties along Harrison Avenue and Albany Street in the South End. The guidelines call for taller buildings along Interstate 93 and around the former Herald site in hopes of creating dense, vibrant city blocks. National Development’s plan calls for the demolition of most of the Herald building. The architecture firm Elkus Manfredi, of Boston, has designed the complex to be like an authentic city block by planning buildings with different heights and a mix of materials, textures, and colors. The signature building would be a nine-story glass apartment building at the corner of Herald Street and Harrison Avenue. 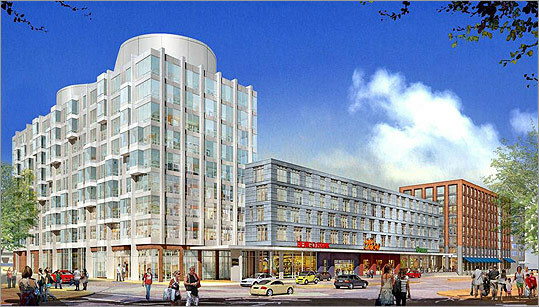 A five-story building on Harrison would house the grocery store, more apartments, and a roof deck with a pool. Two other buildings, at Harrison and Traveler Street, would have apartments above smaller shops and restaurants at street level. National Development has yet to set rental rates, but the apartments are planned to be a mix of sizes, with from one to three bedrooms. Tye said about 15 percent of the units will be designated as affordable, per city regulations. The project would also include a fitness center, cyber lounge, and transportation center with electric-car charging stations, bicycle storage, and a shared-car service.